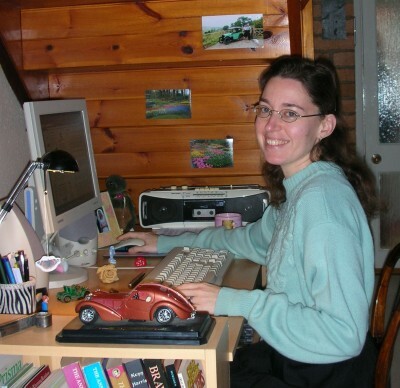 I am a 41-year-old Dutchwoman who moved to England after marrying an Englishman nearly six years ago. Originally I trained as a teacher of English, and I taught at Dutch secondary schools for 8 years. Now my husband and I run our own business, selling spare parts for pre-war Austin Sevens (we went on our honeymoon in the 1925 Austin that has been in his family for half a century). How did you become involved in needlework? I absolutely hated needlework at school – I wanted to join the boys who did interesting things like woodwork and metalwork instead! 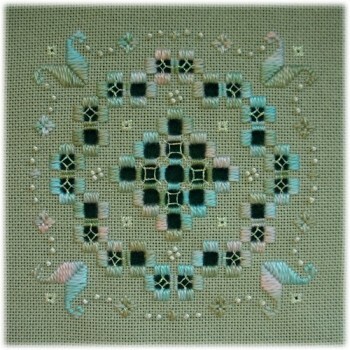 But when I was 19, an elderly neighbour who did a lot of stitching got me interested in needlework. I went to our local needlework shop, which was run by two very knowledgeable and helpful sisters, and bought my first kit. I've never looked back. My husband is my greatest supporter – he encourages, comments, suggests, and helps me to set time apart for Mabel's Fancies within our busy schedule. He is getting quite good at recognising fabrics, threads and stitches! From threads, fabrics, stories, events, nature – anything that grabs my attention! I once based a colour scheme on three jars of spices in my grocery shopping (if you're curious, the spices were paprika, ginger and turmeric, and the DMC shades 919, 677 and 782). Traditional with a twist – my Hardanger designs are immediately recognisable as Hardanger, and use traditional motifs like ships and stars, but I have incorporated quite a lot of colour and some of my designs are more "pictorial" than traditional Hardanger. Quite a few of them, actually, as there is always something that inspires them. Two stand out for me – Resurrection and St Francis. St Francis, which consists of a quotation with an Assisi work capital and a Hardanger cross, was designed for my husband's aunt after she was widowed. At the memorial service, her son spoke the eulogy, and used this quotation to describe his father. Resurrection has been charted and the materials chosen, but it hasn't been stitched yet. It shows a dragonfly, some bullrushes and a tiny beetle at the bottom of one of the stalks. It was inspired by a story I read on my favourite Cross Stitch Forum, about little underwater beetles who are very sad whenever one of them climbs a stalk up to the surface, because they know it is the end and they will never see him again. One beetle decides to climb up himself, look around, and come back to tell everyone what happens when you get there. But when he gets to the surface he falls asleep, and wakes up to find himself the beautiful dragonfly he was always meant to be. Full of joy he wants to rush back to tell his friends not to fear or grieve about the journey to the surface, but his new dragonfly body can't go down into the water. One day, though, they will join him and know for themselves the joy of this new life. How did you get involved in teaching? 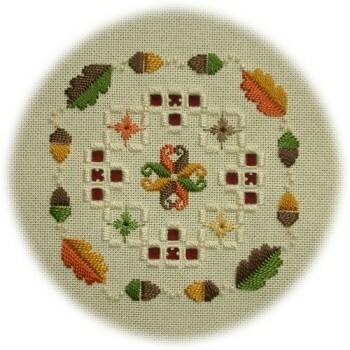 I am a member of a stitching group at the Guildhouse in Rugby (England), our local adult education centre. After a few years I was asked if I could teach a taster course which included several different techniques. So far I have taught three of these courses, which covered everything from cross stitch to pulled work, and from Hardanger to dolls' house miniatures. 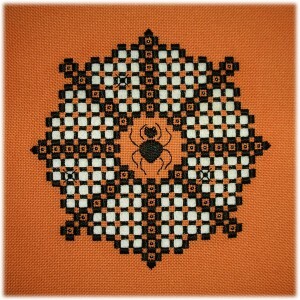 How have the Caron Collection threads impacted or influenced your designs? 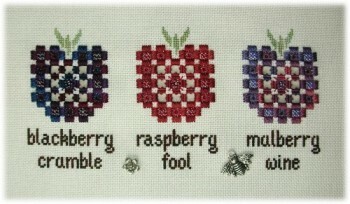 A number of my designs were actually inspired by particular shades of Caron thread, for example Very Berry and Pearl of Great Price. I find the combination of Watercolours, Wildflowers and 25ct Lugana ideal for my designs. I hope I have been a positive influence in the lives of some of my students, and of my two step-sons. It would be nice to think of my designs turning up on the Antiques Roadshow in a few centuries' time as priceless heirlooms, but I think I would prefer to be remembered as a teacher and step-mother who made a difference. The advantage is that it is wonderfully easy to bring our designs to a worldwide audience. The disadvantage is that it is woefully easy for others to bring our designs to a worldwide audience without our permission. Do you cater to any particular segment of the market? 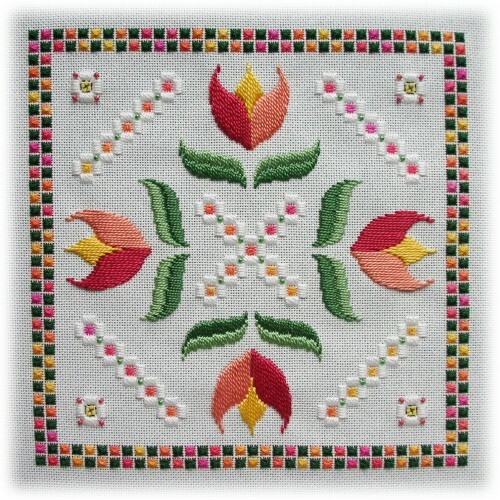 My Hardanger designs are aimed at people who either have done quite a bit of traditional Hardanger and would like to try something a bit different, using colour and various speciality threads and beads; or who would like to take up Hardanger but who aren't attracted to the traditional white-on-white designs; or who like a choice of designs ranging from traditional-with-a-slight-twist to quirky and unusual. By showing them our own enthusiasm, and by stitching with them – starting with projects which they will be able to complete without too much difficulty, so that they do not get discouraged but have a sense of accomplishment. For years now, our church has organised a Christmas Craft Event every November, where local children can come and do a variety of crafts with a Christmas theme. 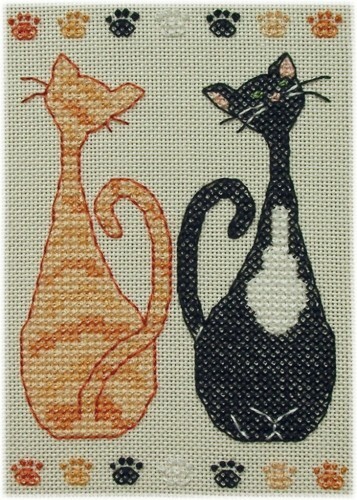 One of the projects is always a stitched one, and children (and parents!) have gone away proudly clutching Christmas tree fridge magnets stitched on vinylweave, holly leaves on perforated paper and baubles on felt, some taking home an extra kit to "stitch with grandma" or share with a sibling.